Welcome to my online resource page. If you have any questions about what you see here, please call 660-646-8000, Option 1, then 1, then 1. Visit my office at 700 Webster Street, Chillicothe, Missouri. Michael R. Leamer is an Associate Circuit Court Judge for the 43rd Circuit Court in Missouri. He was elected to the 43rd Judicial Circuit Court in 2018 for a term that expires in 2022. Leamer, an attorney with 18 years experience in private practice and 14 years as a municipal judge for the city of Polo, filed for the open seat of Associate Circuit Court Judge in 2018. Leamer received a Bachelor of Science in Education from the University of Missouri, where he also then received his Juris Doctor. Leamer resides in Blue Mound Township. He filed on the Republican ticket, replacing James Valbracht, a Republican, who served as associate circuit judge since his election in 2006. 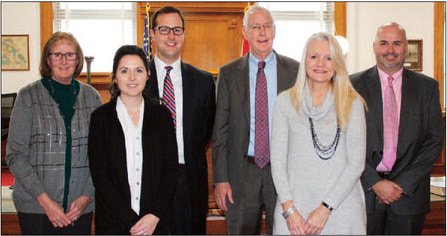 Leamer took office after a swearing-in ceremony held at the Livingston County courthouse on December 28, 2018. The Circuit Court is located on the third floor of the historic Livingston County Courthouse. Phone: 660-646-8000, Option 1, then 1, then 1.